There is currently an informal UN General Assembly meeting on Syria. As now has become a regular feature, right in time for the UN GA today a new "massacre" was claimed to have happened by the rebels and picked up as news rather than rumor in all "western" media. That "massacre" is supposed to have been in al-Qubeir and was said to have 86 victims. A video of that "massacre" shows some ten seemingly dead children and women. But something is weird here. No wounds are visible. Two black pieces of whatever, not recognizable as bodies, are introduced as "burned children". The speaker in the video is clearly propagandizing calling for "the world to act." While I can not prove that it is a complete fake, the video does look staged to me. [T]he Syrian government troops raided a hideout of armed groups in a village of central Hama province, clashing with armed men and killing an unspecified number of them, Syria's state TV channel said on Wednesday. Two of the government troops were killed in the clashes that took place in al-Qubair village, the TV channel said, adding that the troops' raid was conducted after the local residents asked for help. The observers tried to reach the area today but were first held back by the Syrian army which said that the area is too dangerous. The observers passed anyway and, the Annan mission said, were later shot at with small arms. I watched the UN GA on the UN live webcast. The GA is currently chaired (not unintentionally) by the representative of Qatar who's government is, according to its own statements, arming the rebels in Syria and contributes to the $300 million slush fund for implementing violent regime change in Syria. The first speaker was UN General Secretary Ban Ki Moon. He was clearly propagandizing for the anti-Assad party which I found quite shocking for someone who is supposed to be neutral towards UN member countries. He called for "united international action" against Syria which seemed to be a request for sanctions. He was followed by a spokesman from the Arab League who spread more propaganda and called for Security Council sanctions on Syria under Chapter 7. Then came Kofi Annan who had a bit more neutral comment on the situation but noticeable also on the anti-Syrian side. The violence has increased he said. This somewhat contradicts this McClatchy report which says that the total number of casualties are down while government casualties have been going up. He mentioned yesterday's "massacre" as it was confirmed when it so far has not been confirmed. He confirmed that the Syrian government has recently again released hundreds of its prisoners. He also confirmed the "presence of a third force", aka terrorists, in Syria. He still seems to dream of a "peaceful transition" without saying what such a "peaceful transition" would be or how it could be implemented when his plan has been rejected by the rebels from the very first day. Annan was followed by the vice president of the UN Humanitarian Rights Council Simonovic. He differed from Annan in calling yesterday's massacre "not yet confirmed". He again confirmed violence and torture by both sides in Syria. But the reports of his council on Syrian, he says, are only based on witness reports taken outside of Syria. Simonovic seemed to threaten with the International Criminal Court when he called the conflict near to a "internal armed conflict" and said that this characterization has legal consequences. Then followed the Syrian representative Ja'afari and suddenly the UN webcast picture went black. The sound continued though and the representative asked for a minute of silence for all victims of violence. The UN webcast then suddenly switched to UN Security Council meeting about some old tribunals in Guatemala. After some three minutes the webcast went back to the General Assembly. Ja'afari was still speaking but any watcher of the UN webcast will have missed his first remarks or the minute of silence should it have happened. Other representatives followed giving the opinion of their governments. On could clear distinguish the U.S. puppets from neutral countries with the first propagandizing against the Syrian government versus the later emphasizing a political process like China, Brazil, Iran and others did. Interestingly France and the U.S. only send their deputy representatives to read out their statements. The Russian representative more or less accused the rebels of committing the massacres as they have interest in foreign intervention. He spoke out against any regime change and condemned the delivery of weapons to the rebels. He said that Russia was open to a conference of countries that would help to find a political solution to the situation. This may have allured to a new phase of the Annan plan. :-)) Russia could not do that, China can. "China delivered twin surprises on interest rates on Thursday, cutting borrowing costs to combat faltering growth while giving banks additional flexibility to set competitive lending and deposit rates in a step along the path of liberalization. China's first rate cut since the global financial crisis underlined heightened concern among policymakers worldwide that the euro area's deepening debt problems are threatening economic growth. The decision by China's central bank to cut benchmark rates by 25 basis points lifted oil prices on expectations that faster growth in the world's largest energy consumer could boost demand. Brent crude rose 21 cents to $100.43 a barrel, after rising as high as $102.45 a barrel. U.S. crude was up 14 cents at $85.16, after reaching $87.03 earlier." There go those nutty savage arabs again, committing suicide in order to confuse the UN general assembly. Anyhow, Russian client dictators fight on the side of angels. Robert Mood when he spoke to NRK, said they had gotten the names of 49 of the victims, of which 18 were women and children. Almost all supposedly were related. IN Jaafari's speech today, he asked that people remember the 45th anniversary of Israel's attack on its neighbours and its occupation of parts of of Egypt, Palestine, Jordan and Syria. He appears to have intentially left out Lebanon. Not very nice of Syria. The spokesman stressed that what was being asked under Chapter 7 was not a military intervention but only an economic embargo and other turning the screws tactics. "...Gwangju, in which over 2,000 people, most of them young students, were killed by the South Korean military after an uprising against the Chun Doo Hwan dictatorship then ruling South Korea. Thousands more were injured, tortured and imprisoned...."
This was done with absolute impunity, with US assistance and without any interference from the UN. As to Qatar, responsible for massacres in Libya and in Syria, indeed very likely to have provided the arms, ammunition, training, leadership and pay for the units which carry out these killings, the General Assembly should not countenance such a chair, which brings discredit not only to the organisation itself but to the human race. The UN is staffed throughout by spies, time servers and puppets of the US Empire- most recently Jeffrey Feltman, the organiser of death squads in Lebanon and a cheerleader for the Israeli attacks on Lebanon and Gaza, both productive of thousands of civilian casualties, of whose provenance there was not the tiniest doubt, was appointed an Assistant Secretary. The UN is a thoroughly corrupt organisation whose officers are almost invariably chosen by the United States to assist in its plans to wipe out democracy wherever it can be discovered. Not surprisingly these plans are enthusiastically seconded by the kleptocratic thugs who live off the labour and wealth of the Arab people. When BBC list the headlines, the say, as a given - that the latest Syrian massacre was performed by pro-government militia. And for a half-second, I believe it, until I remember, this massacre also happened just before a UN-event, and there is no incentive for any government-affiliate to have done it. In fact, everything in the pattern of massacres point away from the government. Perhaps you missed that Lebanon has been the staging ground for false flag death squads against Syria for months now- THAT is not very nice either. Morons need not apply re: reality I guess. 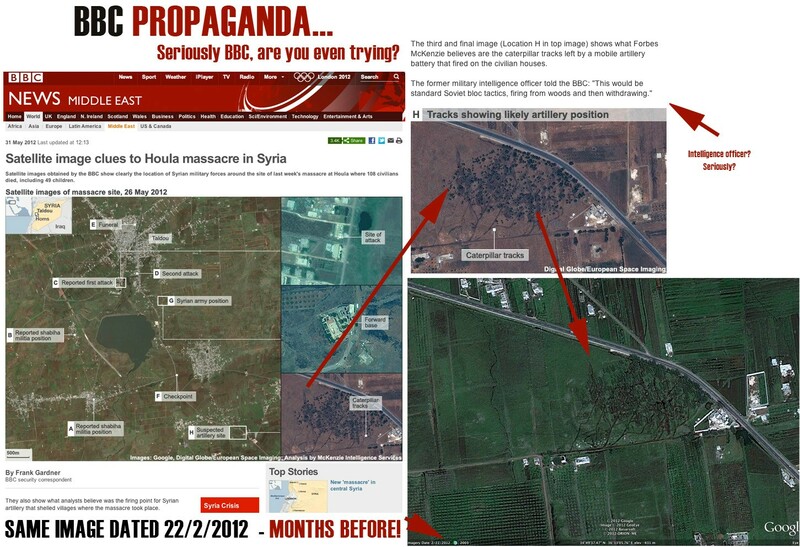 Syrians have been woefully ineffectual in the propaganda sphere. Just lay back and let the western imperialists lob whatever they want at the ocuntry and never go on the offensive- or even worthy defence for that matter. This should hae been done a year ago. Now MI6, CIA, Mossad, SDECE etc have had all this time to set up false flag networks throughout Syria that are now launching and pushing these attacks. Horrible mismanagement by Syria. Sad and outrageous. Why the name-calling? I was thinking about the issue of the occupied in 1967 Lebanese Chebaa hamlets that Syria conceded to the UN was not part of the Golan but Lebanese territory and today's omission by Jaafari appears to hint it is backtracking. according to Syrian opposition activists from the region who object to violence and who want to remain unnamed as they get threatened by violent opposition activists ... the victims where regime supporters. I believe "mastodon" is one of those Easily-Impressed-by-Gothic-Fonts. A peculiar affliction which seems well-nigh uncurable. yes the victims were goverment(not regime') supporters...it will be nice when the MSM finally acknowledges this. What right does Ban Ki Moon have to determine what sovereign country's leader has lost legitimacy??? The guy's now become a law unto himself by virtue of his handlers(Washington)..
Syria: Interview with the German publicist Juergen Todenhoefer. The Middle East expert and former member of the German Bundestag for the CDU party, Juergen Todenhoefer (Jürgen Todenhöfer), has sharply criticized the one-sided coverage of many media about the conflict in Syria. The known German publicist Juergen Todenhoefer (Todenhöfer) accuses the governments of Europe and the United States, that they aren`t really interested in a democracy for Syria. Mr. Peter Scholl-Latour has confirmed the death threats against German Journalist Jürgen Todenhöfer by the “peaceful” Syrian opposition. CBS Evening News leads with coverage of massacres, the new one in Qubeir and the previous "big" one in Houla. The copy talked only about the government or government gangs being responsible for both. But, at the very end, the woman correspondent, after saying that it was very difficult to find someone to drive them to the site noted that they got the outskirts of Huma and were told to turn around "by 'heavily armed Syrian troops." She did say that it was impossible to know who had committed the new atrocities, but she did get through to an "activist" who told her it was the government and its thugs. It's actually not only angering to hear these irresponsible charges, but it's also embarrassing. What a lousy set of reporters. And, yes, I do know they are doing what they're told to do, building the US public's anger to allow the US to go to war or back ugly attacks on Syria. Re: the shooting at UN observers which kept them away from Qubeir -- I imagine this one has been a set piece, with enough bodies for some photos, or maybe a few videos. But somehow I don't think the observers would see what the "activists" have told the world is there. The way the Syrian news is being reported (but only as The Narrative demands) reminds me of the run up to the Iraq Invasion, but back then there were reports on NPR which made it clear that the news coming from the Bush/Cheney administration was not accurate. Also, there would be articles at times in the MCM (Mainstream Corporate Media) which also undermined the Bush/Cheney propaganda, along with magazines. But...now NPR has precious little counterpoint to The Narrative, if any, and I no longer pay all that much attention to the NYTimes and WaPo. I actually feel more alone in trying to tell my friends that they're not getting the real story. Obama = Bush III (with Chenyism, not without). Lebanon: Israeli Arms To Syrian Rebels, U.S. Drone Base To Follow? The reconstruction of the Kleyate airport in the north of Lebanon has begun, Arab media report. According to official reports, the airport is to be restored to contribute to the country’s economic development and to provide more opportunities for the national tourism industry. But some experts believe that the airport is being reconstructed for other purposes. At present the international airport in Beirut, with a passenger turnover of 6 million people a year, fully meets the current needs of the country. It takes 2-3 hours to get to the airport from any corner of the country. Apart from it, Lebanon has one more airport in the north, the Khamat airport, which was built especially for the needs of the tourist industry and also for exports of agricultural products. However the airport has never been used for these purposes because of the civil war in Lebanon in the 1970-1990s. Now, in peaceful times, it would be logical to start using the Khamat airport, located near the sea coast, for the needs of the tourist industry rather than the Kleyate airport, which was built in the mountains as a military airport and lacks civil infrastructure. It is difficult and expensive to transport construction materials along the roads in the mountains. Nevertheless the Kleyate airport has some advantages, too, but not for exporting agricultural products. It is located on the Lebanese-Syrian border. Reportedly, the decision on its reconstruction was made soon after the visit of a Western delegation to Lebanon on January 20. We hear from retired Lebanese general Amin Khteit. “The opening of the airport is officially motivated by economic reasons as well as by the needs of the tourist industry and local residents. But it seems that other reasons are behind it. For example, Burhan Ghalioun, the head of the opposition Syrian National Council, ordered a special plane with medicaments to Beirut, as it was reported, for Syrian refugees in Lebanon. The Assad regime has been losing the propaganda war for many months now. It looks like the rebels are stepping up their fabrications and still the Western press is giving them a pass. One would think that Syria could mount some kind of response in the face of this assault. This reminds me of the propaganda war against Serbia (1993-1999) that was orchestrated by private PR firms that were being paid by Croatian ex-patriots. By the time Serbia realized what was happening, their nation was dismantled. Yugoslavia wasnt so much 'dismantled' as bombed by US/NATO in union with osama bin laden and his jihadis....one of the lead bombers were the germans...who were redoing the Gleiwitz incident. your comment is incoherent, like much of what you say- is it a joke comment? not getting it or its not funny. british regime slated to be on point for this endeavour, like libya. syrian inadequacy vis a vis propaganda, and the public anti-war apathy is horrible to watch. where are all those obama peaceniks?? --Take journalists to any site claimed to be a holding place for peaceful demonstrators. If there are such places, let the journalists talk to the inmates. If there aren't such, then all discussions regarding arrested / detained peaceful demonstrators become moot. --Support the UN personnel who are trying to get to centres of apparent attrocities, accepting that such will be dangerous. Agree to UN-Syrian joint statements of what is their combined best guage of what has happened. If the opposition in that place wish to also add statements, by all means. If there is disagreement, state clearly where it lies. --Name all those killed in Houla and produce photographs, if possible, or other evidence. In Norwegian style, bring those killed to our consciousness - then ascertain exactly who killed them and bring those people, whoever they may be, to trial. --Film at the front lines. Point out what they are doing and why. Show clearly how they are avoiding harming civilians in any way. Explain in real time what their objectives are and how what they are doing is intended to meet those objectives. Have staff names on display, for reasons of principle and accountability. syriens had names, photos and ID of the mercs, French and Brits they caught in Homs and never showed them. very strange, what is really going on behind the scenes wth them, just doesnt mak sense. Regarding the "propaganda war," there really isn't much the Syrian government can do, at least as far as the western media is concerned. The MSM will print what they wish to print and ignore what they wish to ignore. Does anyone think that if Syria could prove it did not commit those massacres the western media would simply report "Oh my. We were totally wrong."??? At best the stories would fall into the memory hole without being repeated. And maybe not even that. Re Ahji #24. IIRC, The former Libyan government tried all those suggestions and it didn't help. Every speech given by Assad will be twisted. Every interview will be combed over for statements to be quoted out of context. That said, Syria can and should appeal to the Arab world. And it has had some success with that. A year ago, most Egyptians I talked to were very Anti-Assad. Now not so much. Even Angry Arab (who is still anti-Assad) has become very anti SNC/FSA. Russia can also help. I would love to see them introduce a resolution at the UNSC about the Bahrain crackdown. I wonder what Clinton would say after that. Ban, Kofi, and the UN in general, have so obviously been 'domesticated' (i.e. turned into craven cowards) by the Yankees that I'm no longer surprised that what the Yankees did to Fallujah (to avenge the death of 4 Blackwater mercenaries) still flies under the UN's radar - not to mention WikiLeaks Collateral Damage video. Until someone remembers, and talks about, the number of times that Yankees have been caught bragging about slaughtering "other people's people" (such as 1,500,000 Iraqis) it would only be good manners for them to STFU about what Syria is doing to "other people's people" in Syria. In the meantime Kofi & Ban should consider submitting to a Gender Test to help us understand why they're acting like a pair of bullied, frightened little girls. That is classic.. I wonder how many naive muslims try to dedicate their live to jihad and are used as puppets for the west..
ahji, yes in principle, though lots of this stuff is not done in the US and other "Western" countries, they should (name tags, filming etc., the filming does not help, you can study Al Jazeera, how deceptive it is.) Norway is a great country with minimal internal conflict compared on an international scale. And the attacker was presumably crazed, with no political movement that would act, though he drew his inspirations from modern European fascists. Syria is a police state with torture and they would not want to threaten their own personnel that goes through difficult times. I guess the Syrian regime's (the word fits as it describes more than government) calculations are correct: win the media war internally with your constituency which they presumably did, keep relations with the powers that are counting in this case (and that is Russia, China) intact. I think the "West" has officially caved in recently and the press will reflect that. It seems that German Christian conservatives have woken up to what might happen in Syria to co Christians though that makes the issue now internationally sectarian which is not that useful really. I guess the Syrian elite has a right to be cynical about UN intervention and heavily politicized UN tribunals. It is the people who instrumentalize human rights politically who destroy them. That is the vile part of Western policy. Problem with "Western" media is that they love this good guys against bad guys stories that make them war propagandists every time. Media critics who assume that the bad guys are good guys and the good guys bad guys do not help. And the pictures of dead babies sell, so they love that, too, making sure there will be a supply line of killed baby photographs. Police repression, terrorism, torture is a vicious self-inforcing circle, that can only be stopped politically. It happened in Ireland among Christians it is not a Middle East speciality. i repeat what i said. PUBLISH the names and photos. Go on the offensive. its like they just sit back and wait for the next PR hit- which is then not responded to and is heavily damaging. find the reporters that are pro-syria (NOT MSM as they will always turn on you) and NOT jews as that will be worst 5th column mistake of all. get those jazeera reporters who resigned over unfair syria coverage and get THEM in there, for ex. if WE can think of some solutions here on a blog, why dont they?? situation is desparate, for god's sake. About the Norwegian terror attack, I never spoke about this before, but it seems the terrorist was a anti-jihadist nationalist fundamental christian-zionist. Indeed, some christian fundamentalists have voiced the possibility that the terror-action was a devine punishment for Norwegian policy against Israel. However it he might have been inspired or even funded by MOSSAD, as some are suggesting, his anti-jihadi persuasion and methodology was a almost blueprint mirror image of Al-Quaida. And, Norway is a good place to live for most, no doubt, but the political system, media and industry is just as corrupted as anywhere in the west. I would like to see a form of direct democratic model introduced, as the representative model that almost everything is modeled on is flawed, but this would require electronic accountable (non-anonymous) voting, and a new free and neutral media for discussing politics and legislature. Maybe sometime in the future. Even with a Norwegian as the UN head of the observer-mission in Syria, news on Syria in Norway are just as flawed as anywhere. He said that the Arab League Secretary General held the Syrian authorities responsible for al-Houla massacre in his letter sent to the UNSC Chief on May 27th, when he said “the painful massacre perpetrated by the Syrian military forces in al-Houla”, then he return today to accuse the Syrian authorities of the heinous, ugly and unjustified massacre of al-Qbeir village in Hama. Why is it taking the UN observers so long to produce the report? Could it be that they are sitting on the report as the AL Observers? Zinc #32, your wish will come true in 3 days; Al Mayadeen TV network begins broadcasting in Arabic in 3 days. Mayadeen is the plural of Maydan, like in Maydan al-Tahrir that everyone is familiar with from the Cairo upsrising. Al-Mayadeen that promises to tell the real news is headed by Ghassan Bin Jiddo and Ali Hashem; both resigned from another Arabic news network because they refused to doctor stories about Syria. "Ali HASHEM: To the regime, when you're saying the regime is fighting to the end, they have no other choice other than fighting till the end, because today any step back by this regime means that the regime will fall. To be frank, the Syrian opposition showed to be really stronger than other oppositions, though they are not united and they are divided. But they were able to do a lot of gains in the country. They were able to control several regions. I can give from my experience, from my former experience in Libya. I remember the Libyan rebels, they weren't able to do what the Syrians are doing. They were—at the time we were in Libya, they were waiting the strikes by the NATO to be able to jump from one area to another. You are talking about a Syrian opposition and Syrian, you know, militants who are able to take control of several cities and several villages without the presence of an aerial cover. So it seems the Syrian opposition's militants are strong enough, and they are having and receiving good and big amount of weapons so that they are able to push the regime into the corner and tell the regime that you have no other choice: either you fight, either you fall. Paul JAY: And they're doing this primarily with the backing of Saudi Arabia. Ali HASHEM: It's not only Saudi Arabia. Saudi Arabia is one of those who are backing the revolution in Syria, but you have also the Qatari support, you have European support, you have the American supports, you know, and it might differ from country to another. Maybe the Qataris and the Saudis are giving the money, the Europeans are giving the political support, the Americans might be doing other strategical things. So there is a big support given to this revolution, to these militants who are fighting right now in Syria, and after 18 months, around 18 months, or less, maybe, of the fighting in Syria, they are able to control several areas. Today if you go to Homs, Homs, there are several cities in Homs or villages that are controlled by the rebels. Also if you go to Idlib, if you go to Hama, if you go to the stronghold of the regime in Aleppo or in Damascus, there are several alleys and neighborhoods that are controlled by the revolutionaries. So they were able in the past year and a few months to do something. And that's why today the regime is fighting to the last—. Alexander 34, it sure is, other than the great humanitarian work of Dr. Mads Gilbert and Dr. Erik Fosse with the Gazans, I don't have many nice things to say about it concerning the Middle East. It has those bright guys that awarded the Nobel to Obama for no reason at all. And when NATO brutal attacks the MSM were trying to tell us that the Arab street supported the over throw MQ. Same with that American revolutionary couch "The AngryArab", just as big a fraud as the MSM,I am still puzzled why people keep reporting from his web site. some of what angryarab says is true..but for an arab(american lebanese) intellectual he is a good eg of cluelessness of the intellentsia! But you're correct that he seems to oppose the only 2 governments (Iran, Syria) still confronting western/Israeli dominance...and paying a heavy price for doing so. I'm giving him the benefit of the doubt (for now) and assuming its because he feels the need to be consistent. However, I'm ready to call "gatekeeper" after a point. very disappointing. anther crrupt oficial who is using his influence and betraying syria. get him out now along with his wasta family. zinc, the story is being twisted here. The initial story had Sheherazade asking Walters for a job at ABC, that Walters could not or would not give her, but she did offer to help Sheherazade get into Columbia. So the Columbia thing was started by Walters and there is no influence or corruption involved in this story. The Syrian rebels have been able to make gains. They have been able to control several regions. I remember the Libyan rebels weren't able to do what the Syrians are doing. At the time I was in Libya, they were waiting for the strikes by the NATO to be able to jump from one area to another. You are talking about Syrian militants who are able to take control of several cities and several villages without the presence of an aerial cover. So it seems the Syrian opposition's militants are strong enough, and they are having and receiving good and big amounts of weapons. As a related point I say it is unclear or unconvincing why the Syrian government signed the Annan agreement under which the government cannot use military force against the rebellion. The Annan agreement expires on 20 Jul 2012. I ernestly hope the government will order a full and vehement onslaught on the rebels when the Annan agreement expires. I am taking hope and expectation about this from the following excerpts from Bashar's speech on 3 Jun 2012. In these excerpts I read Bashar's word "terrorism" as synonymous with "the violent rebellion". @ brian #45: You have no decent evidence of that, I assert. “It is wrong always, everywhere, and for anyone to believe anything upon insufficient evidence.” I challenge you to give us reliable evidence. I get the impression that there are distinct fractions of opposition. Mainstream media never ever covers the origins of the opposition or their motives or anything at all about them. Someone on this board posted an interesting link to an agency report to this "exile government"
Then there's the "SNC" which is the muslim brotherhood. So I see at least two rivalling fractions, one being set up by france, the other on probably by Saudi-Arabia and Qatar. Turkey might pursue their own goals as well and I wouldn't be surprised about the opposition groups fighting one another. This is also the one chance I see for the existing government: they know their country the best and if they can rely on the most part of their administration and intelligence, then they must try to play these fractions against each other. Parviziyi #44, you began by saying that Hashem was mistaken in saying the rebels controlled certain areas and you went on to demonstrate this by elaborating on what arms they and the government forces were allowed to use under the Annan plan. What does that have to do with proving or disproving that the rebels control certain areas of Syria? The 4 paragraphs in your answer didn't go anywhere near this subject. @ 'www' #48: Ali Hashem observes that the rebels are in control of certain localities -- a fact that we are all well aware of. From that observation he infers that the rebels are strong and well armed -- an inference that is totally mistaken. Odd reasoning, Parviziyi, you concede that the rebels control certain localities, but can't accept that this is so because they could be strong and well armed. Strange. Also odd that you didn't know that Hashem and Bin Jiddo are the good guys as they quit their jobs at AJ because they refused to twist the truth in their reporting about Syria as it asked of them by their superiors. You and Brian want everyone to be 100% on your side in your blind faith in the regime and will not accept any criticism of it even if it's by people that are pro-Assad or anti-FSA.